One of the decade's biggest game franchises returns for another round of alien-blasting, pulse-pounding, first-person shooting action. And it comes back not just with a whimper nor a bang, but with a shockwave-causing, mushroom cloud-creating mega explosion. Say hello to Halo 3:ODST. [firstpara] In Halo 3:ODST, players won’t be taking control of the series’ iconic metal-clad super-soldier, who we know as Master Chief. Players instead, will be put in the boots of highly skilled troopers called Orbital Drop Shock Troopers (hence, ODST) who have been sent to the city of New Mombasa to extract valuable data. Except there’s not much to extract as the alien race aka the Covenant has already destroyed much of the city. Fans of the series will surely enjoy the fact that this game gives them the chance to find out the things that have happened while Master Chief went to face the Covenant in their home turfs during the events of Halo 2. From the start, there is a sense of suspense as the ruins of towering structures provide a great spot for the enemy snipers to kill you at will. But that's not the only danger that awaits as a half dozen of these alien troops will try to ambush you as well. These skirmishes come when you least expect them, so you’ll have to think quick, and strategize before bullets rip your body apart. Obviously, there’s not much space for boredom, especially not with many of Halo’s famed armaments and vehicles also returning to add variety to your game-playing experience. 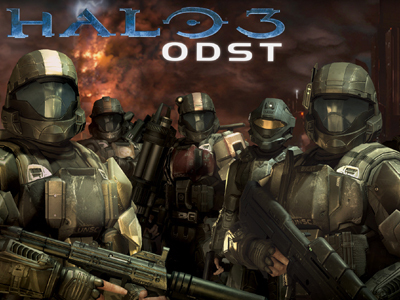 Halo 3:ODST lives up to the same brand of multiplayer excitement generated by its predecessors. Many of the modes that have been present since the first game have been carried over, but ODST adds something new to the table: the Firefight mode. You and up to three friends will have your skills and balls tested to the max, as you face off with a seemingly never-ending barrage of alien baddies. Firefight mode has 10 levels, with each level giving you bigger and meaner enemies as you progress, forcing you to come up with better tactics each time. It’s a borrowed mode from, say Gears of War 2, but Halo 3:ODST does it well enough to silence the haters. Overall, Halo 3:ODST is simply one of the best action games to come out this year. Master Chief is mighty proud!